It's all about ergonomics, clean signals, and convenience. It all started with the idea of building an ergonomic layout with excellent RF and AF isolation to prevent RF feedback problems with a second floor installation. This is Operating Position 1 and at this point, it is incomplete, but entirely operable. Several of the accessories are not yet connected and this operating position awaits its center piece, either an ICOM 7800 or and Yaesu FTDX 9000D. You'll see which I choose as you read on. However, there is far more to the story of this console than the final selection of the main transceiver. One purpose of this console is to demonstrate many of the techniques I have been writing about in my publications. Grounding techniques are one major focus and ergonomics for operator convenience and comfort is another. Very important is the isolation of all RF and audio systems. Much of this is done via remote coax switches, remote "pickup boxes" for instruments, and a remote controlled linear amplifier. All of the audio components are on the left side of the console and all RF equipment is on the right side. There are separated as much as possible. Further, all remote RF switching is located at "ground central," the ground plate. I'll explain each of these in detail later when the console is completed. You'll notice that there is not a lot of equipment at this operating position, and at the time of this writing, there is even less. The computer has been moved to the floor and the console now has only one transceiver. Also, there doesn't seem to be a linear amplifier, though one is definitely in use. 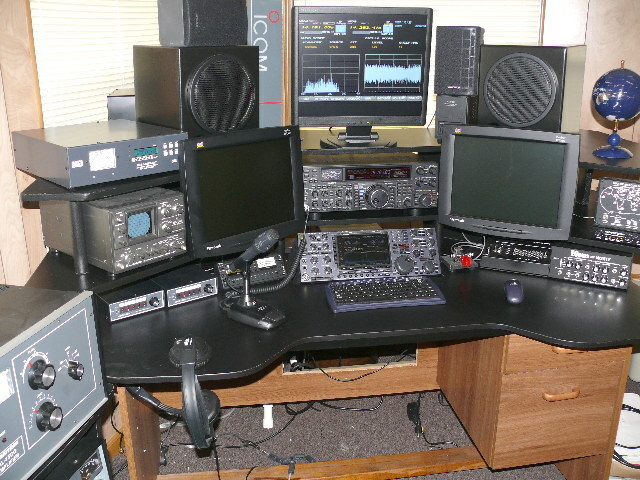 Two 15" LCD monitors are used in anticipation of future transceiver readout features and to provide easy display of computer and rig control programs. Let me tell you about the equipment chosen for this station. The selection was based on personal preference, performance, convenience and compatibility ...... and, it had to be black or dark gray in color to fit into the console's black-on-black motif. Center stage are the two 15" LCD monitors. These have proven themselves to be a good choice. CRT monitors would have had limited location options, added a huge amount of weight to the support shelves. The LCD monitors do not cause any RFI that I can detect. The bases were removed so that they could be mounted directly above the transceiver with the exact same viewing distance as the transceiver's readout. This is important when you get to my age and wear bifocal glasses. The transceiver is slanted back at an angle which results in a 90-degree angle to the line of sight. This is not the optimum control angle, but it is the best for reading control labels and viewing the digital dial readout. Ergonomics is the key to fatigue-free operating. Everything is at the correct angle for easy viewing and all controls are at the correct distance and angle for easy adjustment without reaching. Everything in its place. The overall layout is such that the viewing distance to all equipment is the same. Further, the controls on various equipment are also in just the right position so that my hands fall naturally on each control without reaching. For example, in this photograph, you can see that the keyer paddle is exactly in the right position and angle to the right side of the transceiver. The same goes for all of the equipment on the table top and first shelf. The tuning knob of the ICOM 756 Pro is only a few inches above and to the right of the keyer - and at the same distance and angle so that the elbow of my right arm does not have to be repositioned to reach other controls. You might notice that the "Pro" is not parallel to the shelf ledge. That's because this is an experimental console and it will be redone as a nicer piece of furniture later. I'm only trying to fine tune a paper design. I used shelves from a previously built console and the angle is off by 15-degrees. To avoid RF getting into the audio and computer systems, the AF and RF sections are separated as far from one another as possible. Double-shielded coax, Line Isolatorstm and many ferrite cores are used. They may not be necessary, but they are good insurance. The object is to produce a clean signal. Audio to the left, RF to the right. In order to provide minimum interaction between the RF and audio sides of the station, I've separated the two as much as possible. The audio cabling and computer cabling are confined to the left side of the console. The only RF on the console is the coax from the transceivers to the remote linear which will accept input and control from two transceivers. Everything possible is remote-switched or controlled. There is one expectation that could not be avoided, though. I require a scope in each of my operating positions. In this case, RF does have to come back to the monitor scope from the linear and since I am using a "trapezoid" mode in the scope at this time, transceiver coax goes to the scope before it runs to the linear. However, these cables are confined to the far right side of the console and double-shielded coax is used. Now that only one transceiver is in use, the runs are much shorter and isolation is better. Eventually, only the output of the linear will be monitored. This is a new amplifier for me and it doesn't take much power to drive it. I'm using the trapezoid pattern to make sure the amp is not overdriven and its output is as clean as possible. The point to all this is to have very clean audio. I appreciate what some of the fellows have done to improve their audio in recent months. I want my audio to sound good, too. No, I'm not a wideband, hi-fi fan. But, I've heard some wonderful audio from stations occupying less than 3 KHz and I applaud their efforts. It's most pleasant to listen to signals that sound full and natural, but still have punch. Since my station is located on the second floor, I have problems with long ground runs. To complicate the issue, I use very low takeoff angle antennas which concentrates RF in my shack and I've had problems with RF in the audio in the past. With the use of proper grounding techniques, the application of grounded Line Isolators, interrig Line Isolators, and ferrite cores on interconnecting cabling, I have been able to eliminate the RFI and ground loop problems altogether. Keeping the RF away from audio in the console is just one step in the process. Good shielding and grounding techniques are equally important. A quality speaker will improve the sound of any receiver or transceiver. Only a few speakers are up to the job and Kenwood, Yaesu or Icom don't make them. Sounds Sweet to me! Above the two LCD monitors are a pair of "Sounds Sweet" speakers. I've used more than a few different speakers in my ham shacks and one of favorites is a speaker that I built. It has a wonderfully rich sound. It in a closed box about 8" wide, 10" high and 8" deep. The driver is a 4" full-range dual-cone with a 40 ounce magnet. There is also a mid-range control that does a great job of tuning the speaker for communications use. Unfortunately, I have no idea where I could find more of those 4" drivers, so I had to look elsewhere for quality speakers for this operating position. I've had good success with some Hi-fi bookshelf speaker (medium to high end in price). In some, I've disconnected the tweeters to reduce unnecessary high frequency content and unwanted band hiss. None approached the quality of sound quality of my homebrew speaker. That is until I purchased a "Sounds Sweet" communications speaker. They sound nearly as good as my homebrew speaker and far, far better than anything else I've tried. The "Sounds Sweet" speakers produce a very high SPL (sound pressure level) at low input power from the transceiver. Thus, they are capable of high volume output without taxing a transceiver's normal one or two watt speaker audio output. These 13-pound, 8" bass reflex speakers with dual cones cover a frequency range of only 200 - 7000 Hz. They may be the best thing I've ever done to improve the sound of any of by receivers. Well, enough advertising someone else's product, but I did like this speaker so much that I purchased a second one anticipating the two output channels of the ICOM 7800. The linear amplifier is a remotely controlled ICOM PW-1. OK, where did you hide the linear? The answer is simple, it is an ICOM PW-1 one kW solid-state linear and it's mounted on a roll-around table on the right side of the console. On the back of the table is "ground central" and the RF switching relays for the entire ham shack. The tiny control box for the PW-1 is located on the tabletop right next to the keyer. It's the little 8" box with two lighted meters. The amplifier is essentially transparent in operation as it is controlled by the ICOM 756 Pro. It's like having a kilowatt transceiver. The metering, antenna switching and rig switching functions are all handled by the remote head on the desktop. The PW-1's built-in tuner will tune any of the RADIO WORKS' antennas and that is definite plus, especially since the built-in tuner has memory. It is fine, though somewhat expensive amplifier. 1100 watts out on all bands gets the job done just as well as my manually tuned AL-1500 which is now part of operating position #2. The computer keyboard and mouse are wireless. This keeps wire clutter down and keep the keyboard and mouse cables far away from the RF side of the console. A wireless DSL removed all sorts of nasty little problems I had when I used a dial-up ISP and long telephone wires routed around the shack. In keeping with the wireless theme of this operating position, the keyboard, mouse and high speed DSL connection are all wireless. To preserve space on the desktop, I found a wireless keyboard similar to ones used in notebook computers. It has full-size keys and all of them are in the right place, but there is no wasted space. When I'm not using it, I just pick it up and set it to the side. There are no wires. The same goes for the mouse. This rodent is somewhat unusual in that its movement is sensed by both an LED and a gyro mechanism. When the mouse is lying on the table top, it works like a standard optical mouse. Pick it up and hold it in the air and the gyro motion sensing system comes on. You still have complete control of the computer's cursor, several feet away from the nearest tabletop. Thus, I can sit back in my chair, mouse in hand and just twist and turn it to control just about everything in the station. It sounds like fun, doesn't it! The wireless DSL is a new addition at W4THU. I've recently linked all six computers in my house with a wireless network. I was using a dial-up ISP in the ham shack, but the DSL made it possible to really speed things up. Besides speeding up my Internet connection, the wireless DSL system removed one more wire that could route RF directly into the computer. What else is there on the RF side of the console? I seems like everything has been covered but the Autek wattmeter which monitors the power from the transceiver to the linear. This meter is really not necessary since the transceiver metering gives the same information and the PW-1's control box indicates the output power of the linear. Of course, like everything else, this meter has a remote head. Eventually, it will probably disappear. Audio is tailored by the W2IHY EQ/noise gate. Later this year I may add his new box of tricks that works in conjunction with the EQ. Audio is on the left, and there are a couple of interesting items there. Just to the left of the transceiver is the W2IHY noise gate and audio equalizer. This little box really helps round out and richen up the sound of my transmitted audio. Immediately to the right is a "Rig Blaster Pro." I don't know if either of these boxes will be used once the ICOM 7800 or FTDX 9000D is in place. For now, the Rig Blaster Pro is just occupying space and will not be wired up until the final rig is in place and the actual requirements are determined. On the first shelf above the audio equalizer and the Rig Blaster Pro is an MFJ Beacon Monitor. Its receiver won't lock on the atomic clock, but it's accurate enough to determine what beacon is being heard. The RF switching control boxes are left of the Beacon Monitor. These are two Ameritron 5-position remote switches. A few ferrite cores keep any stray RF off the control cable and as the console is optimized, these two switches may be located on the right in place of the Autek wattmeter. The bottom switch selects the desired antenna and the current choices are a CAROLINA WINDOM, a SuperLoop, and a full-size 75 meter vertical with elevated radials. The top switch route the selected antenna to the operating position in use. 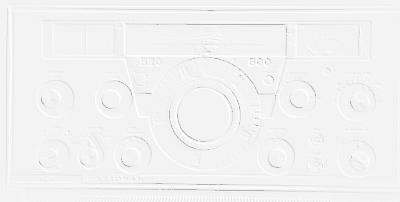 There are four positions: Number 1 is this console; number 2 contains the Collins S-Line and a FT-1000MP, AL-1500, etc. ; number three are the Collins Gold Dust Twins; and position number 4 is whatever transceiver I have in my home-office at the other end of the house. I'll give more details about all the wiring and grounding in a future article. A Heil headset is currently used, but a boom mic will be installed. There is one thing I missed - the microphone and headset. I use the Heil Proset that features both a widerange and the DX cartridge. Eventually, a boom mic will be installed and I am yet to determine which mic I will use. I'd like to use one of my condenser mics, but they are not practical in a ham shack setting. They simply pick up to much ambient noise. Main Rig Now you know what I chose for the main station rig. It's the ICOM 7800 with all the updates including the 3 kHZ roofing filters. The '7800 drives a PW-1 linear which sits in the bottom of the rack at the left of the operating desk. I won't go into a lot of detail about the 7800 right now, but I can say this: I'm not sorry I chose this rig. It is simply incredible and it's perfect for this ergonomically designed station. Secondary Rig I've always loved the FT-1000MP, so when the FT-2000 became available, I sold my 1000MP and brought home a FT-2000 with the DMU (digital unit). If I couldn't have the '7800, this would be the rig at the top of my list. It has features that the ICOM doesn't have, just as the ICOM has tons of features no one else has. The two rig complement each other quite well. When time permits, I'll go into details of my impression of this rig along with the '7800. I didn't choose to go with a solid state linear for the FT-2000. Instead, it drives the AL-1500 that you see on the left side of the desk. The AL-1500 is fed through either the reliable old Heath tuner sitting below the AL-1500 or the MFJ legal limit automatic tuner sitting above the Kenwood scope. All RF equipment and cabling is carefully routed on the left side of the desk, while audio equipment and cabling is on the right side. RF and AF systems are isolated and shielded as much as practical. Line Isolators are used liberally, as are ferrite cores on most of the audio leads. I'll try to give full details (perhaps a photographic story) of the final installation. As you can see from the mess on the floor, I'm still wiring up all the gear. 3 LCD Monitors As you can see, I've added one more LCD monitor. I was going to use two 19" monitors on the top shelf of the desk, but one was enough. Actually, it's much too large for the information displayed (it's the digital display for the FT-2000). I'll move that function to the 15" monitor on the right side of the desk and the 15" monitor on the left side with be used as an enlarged display for the ICOM 7800 or at the flick of a switch, it will be the computer's second monitor displaying the most needed information. The 19" display will probably become a 17" wide screen and be used as the main computer screen displaying less essential information. 4 Speakers Each receiver (two in each rig) has it's own speaker. W2IHY Audio On the right side of the desktop is the W2IHY speech processing gear. Rig Expert Plus This neat little unit sits above the W2IHY sound gear (just below the MFJ Beacon locator). The Rig Expert Plus is a two channel box that processes the audio from both receivers in the '7800. It accepts the optical output from the '7800 and has an on-board audio card which leaves the audio card in the computer ready for other duties. The Rig Expert Plus and the computer connects to the computer through a single USB cable. On the Left side of the desk Sitting on the desktop at the first level are the two remote coax switches which select the desired antenna and which rig in the shack the antenna will be connected to. To the right of the two coax switches is the control head for the PW-1 linear. The Scope is the Kenwood monitor scope which keeps track of the output from the AL-1500. What's missing The VHF rig is an ICOM 7000 which is currently mounted in my travel trailer. On the road it feeds a 27' vertical (when stopped, of course) on all bands from 160 - 10 meters or the appropriate 1/2 wave antennas for 2 and 440. 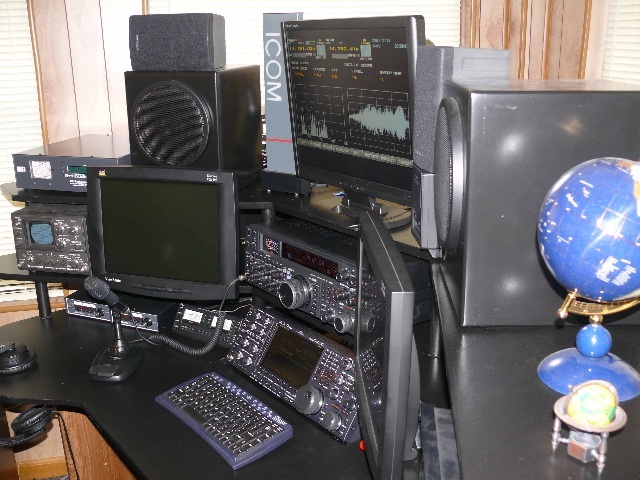 In the station, here, the ICOM 7000 serves as an all mode VHF/UHF transceiver and feeds 1/2 wave verticals mounted at the 80 foot level in a nearby just outside the radio room. This is a side-view of the station. Small changes will still take place. This setup has is a much better layout than the previous one and the two shelves were redone to improve the viewing angles of the various pieces of equipment. 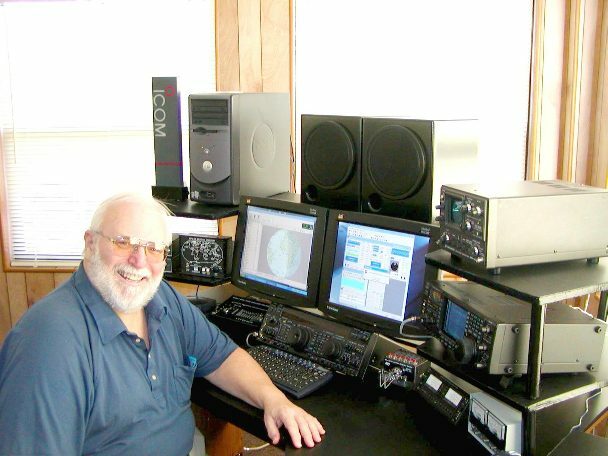 As the sunspots start to return, I'll spend more time in the shack and enjoy getting on the air more. One final though before I post this page. Is all this gear necessary to have fun on the air - NO! I could pull out my old Kenwood TS-930SAT and hook it to one of my Collins 30L-1 linears and have a ball with a minimal investment in equipment. I build these top-of-the-line stations because I enjoy building them and problem solving. I spend uncounted hours designing these stations on paper and then turning that into a real dream station. Sure, these stations are a blast to operate and experience. But, the bottom line is "fun." I still stand by what I've said in several of my publications. 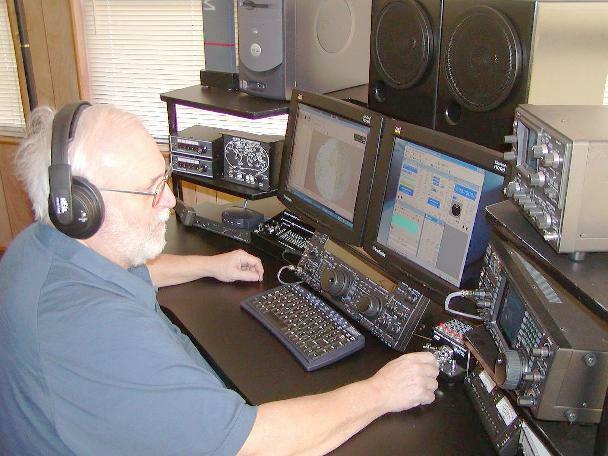 "Ham Radio is a Contact Sporttm" and it's easy to be a "Budget DX'ertm." It just takes a little planning. Now that I think about, it would be fun to assemble a very high performance, low cost station just to show what can be done on a budget. It would be a wonderful contrast to the station I've described above. And, I'll bet I can work most of the DX on the air with the "Budget DX'er" station. It'll just take a little more effort, but that can be a lot of fun, too! See you on the air. Sorry for being so brief. Also, I apologize for the terrible photographs. These were just quick snapshots to document progress. I though you might enjoy seeing where the project is heading. The details will be a lot more fun and informative.